After a particularly difficult day that included a multitude of tears and confusion about what God was doing with my life, God sent me to Psalm 56. It’s a beautiful passage written by David at a point in his life when a 29-year-old David’s life was falling apart. David had been secretly anointed king by Samuel almost 20 years earlier and had been serving King Saul for about the same period of time. He had a bright future but now King Saul had decided to kill him and David was forced to flee the country. He went to Gath which was the home of Goliath the giant he killed just 14 years earlier. The people of Gath recognized him and David was so afraid for his life that he acted insane (1 Samuel 21:10-15). David wrote a beautiful song while there about his fears and tears. “To the chief musician upon Jonath-Elem-Rechokim, Michtam of David, when the Philistines took him in Gath. Be merciful to me, O God, for man would swallow me up; fighting all day he oppresses me. My enemies would hound me all day, for there are many who fight against me, O Most High. Whenever I am afraid, I will trust in You. In God (I will praise His word), in God I have put my trust; I will not fear. What can flesh do to me? All day they twist my words; all their thoughts are against me for evil. They gather together, they hide, they mark my steps, when they lie in wait for my life. Shall they escape by iniquity? In anger cast down the peoples, O God! It’s the new mission building. It has a large food pantry, a fellowship hall (that will accommodate our large congregation), a kitchen, and even showers and cots for in case people need to stay due to a natural disaster. It has been years in the planning and two days in the building…Yes, two DAYS into building from the concrete slab and the trusses are already going up. The entire building will be up in just a week. It is thanks to a group of about seventy men who paid (yes, PAID) their travel expenses to come up, from several hundred miles away, to build this building for the church. As I watched these men work Saturday, I noticed just four or five men were in their twenties or thirties, a few were in their forties, but most of them were fifty or older. During church Sunday, it was apparent that they were passionate about what they do even though they will probably never see this building completed and ministering. They may die before they ever hear of what this building is used for. They will never see the many families the food pantry will feed; nor will they see the cots scattered across the floor giving tornado and flood victims a place to sleep, eat, and shower. 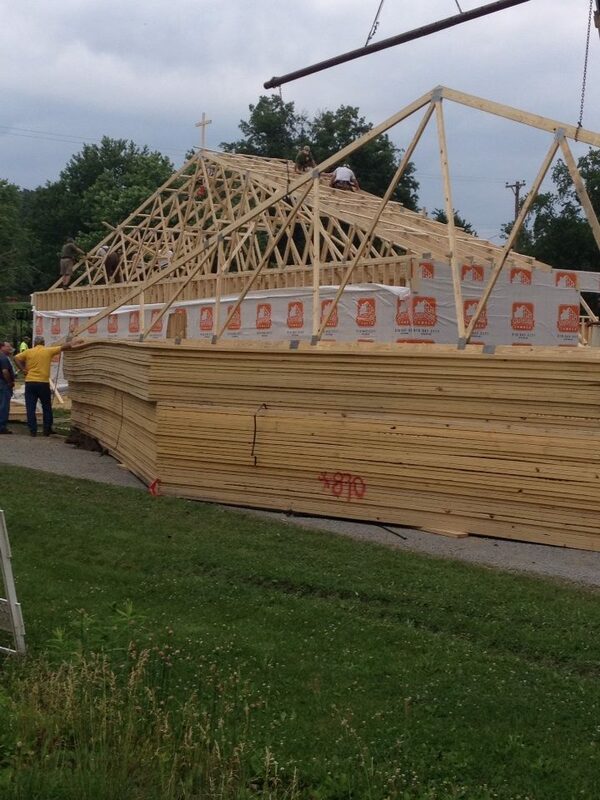 They will probably never share a hearty Baptist meal under those trusses they set today. Yet that doesn’t stop them. They drive each nail in while sweat glistens on their smiling faces. They have peace in their hearts even when things go wrong. They sit down during break and laugh with laughter that comes from deep within. They are joyful when they think about how many people this building will help; people they will never meet. Yet when these men get to heaven, they will realize that, like David, they “prepared abundantly”. Many times in life, God calls us to prepare for things that we will never see fulfilled. Then again, if we are just preparing, we’re doing it wrong. We are called to prepare ABUNDENTLY. We are called to pour everything we have into what we are doing. Some are called to put every last penny they can into the mission fund even though they will never see the souls saved due to their support of a missionary. Some are called to spend every extra minute they have composing or arranging a new song to praise the Lord with, yet they will never see all the lives touched, strengthened, or changed when that song is sung. Isaiah and Jeremiah pleaded and prepared for the return of Israel, yet died before the nation repented and returned to God. Stephen preached before the Sanhedrin, yet died before seeing the persecutor of the church, Saul, give his life to Christ and become Paul the great New Testament evangelist. William Tyndale spent his life translating the Bible into English, yet died before seeing it completed or allowed into England. Jim Elliot prepared to minister to the Huaorani people, yet died before getting to see even one soul saved. What about you? What are you called to pour every ounce of energy into? Will you be able to look down from heaven and say with a shout “THAT is what I prepared for!”?